Statisticians are now telling us we may live in retirement for 30 years. What they don’t tell us is how to make our savings last for three decades. 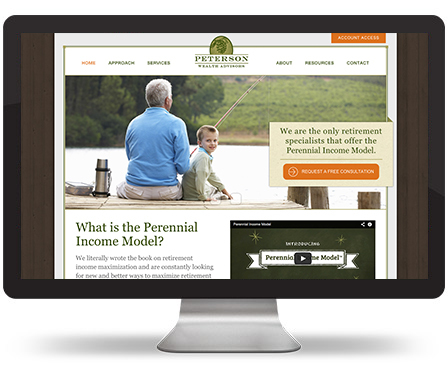 Peterson Wealth Advisors has a plan: The Perennial Income Model. And we helped Peterson bring it to life. This summer, we accomplished a complete strategic and creative overhaul for the Orem, Utah based company in record time. We first took Peterson through the Perception Branding 5D Process, building a foundation of understanding—before creating anything. The business name was modified and the retirement model was given a name and logo. We designed a new identity including a new tagline. The identity was incorporated into the design of stationery, business cards, a new website and video. The website introduces the team, the investment approach and describes services.